Federal CIOs face growing pressures to modernize their IT operations. Yet, rapid changes in technology and cloud-based services make it especially challenging for agencies to develop a viable IT modernization roadmap. Federal CIOs aren’t alone, says Kyle Leciejewiski, who leads data storage solutions throughout the America’s for Dell EMC. Dell Technologies recently interviewed about 1,000 CIO’s globally and 48 percent responded that they were unsure of what their industry might look like in three years. Although 95 percent of companies surveyed were somewhere on the road to digital transformation, the 5 percent that had actually transformed through IT modernization had significantly out-performed the rest, Leciejewski says in a FedScoop podcast. Organizations usually look to transform their IT as a way to lower costs, attract new customers or gain competitive advantage. And there are a number of core areas CIOs should look at, including new capabilities in all-flash and solid-state storage, and technologies that can easily scale-out and back as needed. Agencies also need to plan for software-defined and API-enabled infrastructure solutions that make it possible to automate and deliver IT services more smoothly and connect to a multi-cloud world. These capabilities can largely be described as “modern architecture” pillars. Leciejewski describes how organizations can “take these modern architectures, and package them in to modern infrastructures which then creates the foundation of the modern data center”. Modern infrastructures are manifesting themselves as converged or hyper-converged platforms. But laying the right foundation for transformational IT depends on working with partners that have the ability to integrate servers, networks and storage to help organizations move quickly and securely, he says. “Having a portfolio [of solutions with market leading capabilities allows us to] do the strategy before execution and is a big differentiator that Dell Technologies brings to the transformation table,” explains Leciejewski. Find out more on how agencies can realize big dividends in data management, IT security and workforce productivity, or learn more from other federal Digital Transformation Heroes. 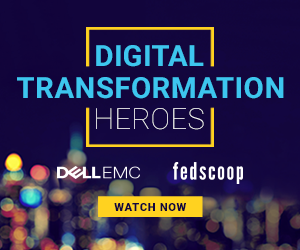 This article and podcast were produced by FedScoop and underwritten by Dell EMC.